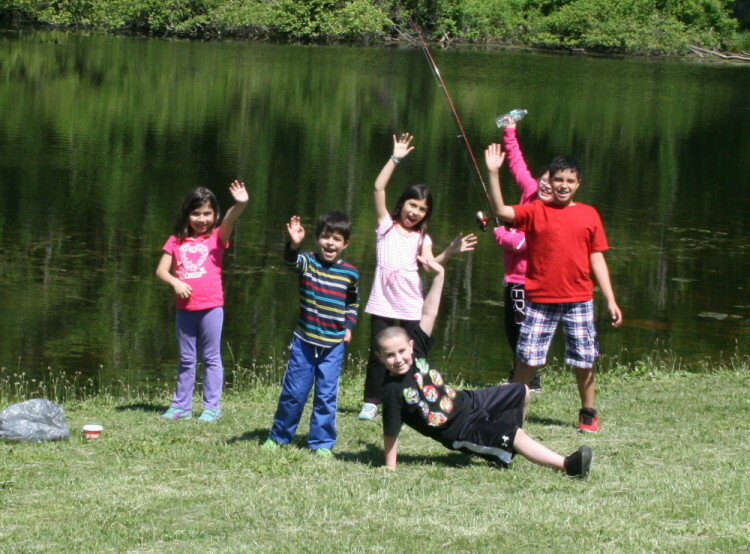 What would a Memorial Day picnic be without a little fishing? Memorial Day came a little early this year but it sure brought some great weather! 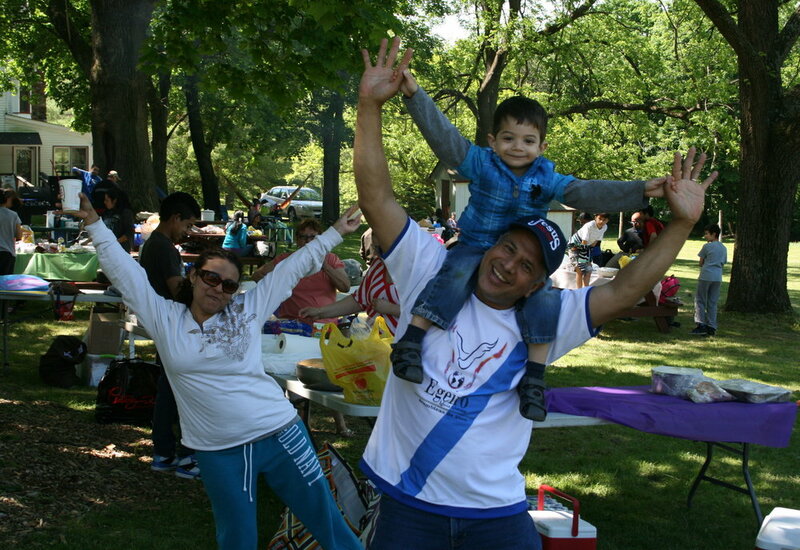 Each year many of our Latino churches visit Camp Lebanon on Memorial Day for the biggest picnic of the year. The day is filled with food, games, worship and so much more. Did I mention there was food? With temperatures in the low 80's and no threat of rain, the party was on all day and on into the night. This year's great weather brought 1045 people from at least 20 ABC churches throughout New Jersey. Hopefully we will see many of them for our Latino Camp session this summer running from July 20 to 26, 2014! The summer camping season is coming to an end today. The last camper is only moments away from departing camp grounds for his trip back home. The staff, those that are still here, are working hard to clean everything so that our next user group can move in later today! As Camp Lebanon is moving out Camp Fatima, a camp for youth with special needs, is moving in. We are moving to our farewell dinner together as Camp Fatima is moving to their opening day together. This summer brought with it many frustrations and many rewards; which is the normal summer routine. Our attendance was down this year after having gone up last year. 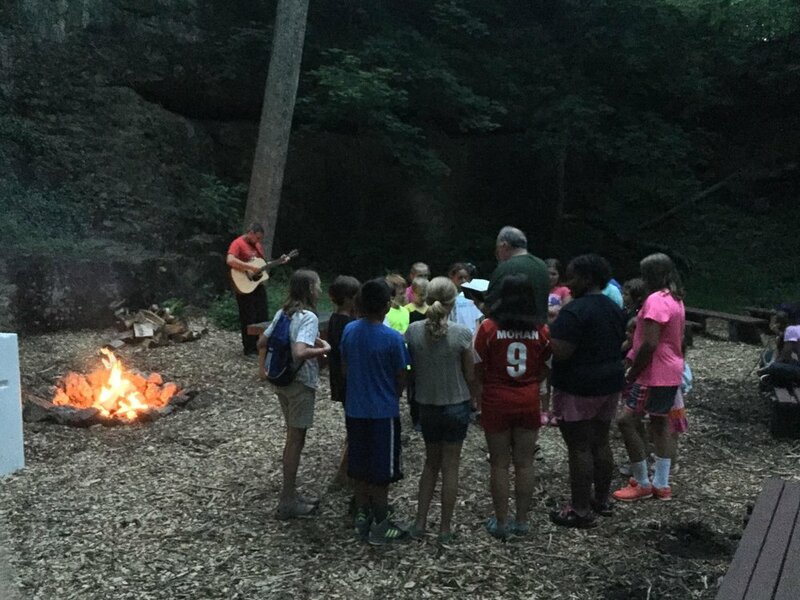 Yet, our campers making first time commitments to Jesus Christ was up! We had almost seventy young people go forward at a commitment service or share with their counselor later that they wanted to give their lives to Christ. During Latino Camp eight young people asked their pastors to baptize them when they got back to their churches. Summer staff was quite interesting too! This was a year with a very high turnover ratio with very few returning staff. The high turnover brought with it some problems and some rewards as well. This staff has chosen a theme name for themselves and the entire summer as "The Year of the Newbies!" Overall the staff was very good. The summer of 2013 saw one of my "older" and more mature counseling crews. The maturity level brought with it more spoken blessings at meal times. Normal meal times are filled with a silly song as a blessing, this year even the campers were praying out loud for the meal! Our last meal together will be in a few short hours as we share our victories, stories and laughter. Some staff will be looking to next year while other will be looking to see what comes next. Some have a clear path ahead while others are facing some uncertainties. No matter what we are facing ahead of us, it is clear to me that we have shared in a good work as we talked about our faith and shared the Gospel of Jesus Christ with each and every camper, staffer and friend that came to this very special place called Camp Lebanon. My prayer for you is that your hearts will be stirred to come and see for yourselves and get involved as we go forward to what God is calling us to. Camp has started and believe it or not we are already in week three! Things are moving very quickly this year and as usual I am way behind in my office duties. So let me take a moment to recap what has been happening. Orientation week went really well. This year I did not need to hire any International counselors because I had enough Americans apply for staff positions. I do, however, have one staffer that is originally from Ecuador and one from China. I also have one staffer that came here from Germany even though he has only lived there for three years, so if you stretch your imagination just a bit...I still have an International staff! Junior 1 camp was a bit larger than last year's session and Sailing 1 was a little larger too. That is our ups for this article. Junior 1 had about 24 young people go forward at the commitment service. Most of the young people were making first time decisions for Christ while the others were recommitting their lives to Christ. That number is almost half of the entire camp that went forward at the invitation! Last week's Junior High camp was smaller than normal. 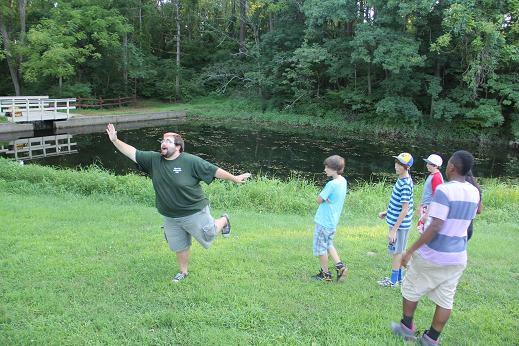 Junior High camp is always an interesting camp as my friend Rev. Chaz Hutchison stretches everyone with new games and challenges. Chaz likes to have staff take over vespers as the week goes along and four different staffers lead the vesper worship services. Even among our staff we are trying to build stronger Christians! When staff step out in faith to share their faith with the entire camp people take notice and campers tend to listen a little closer. I am proud of those that dared to step up and lead. Also, during the Junior High camp I challenged the entire camp with a Bible question, I will be using it later and do not wish to give you the question or answer in this article. I offered a pizza party to the cabin group that came up with the correct answer. All week long I had campers coming to me with Bible verses that they thought answered my question correctly, it was great to see so many young people using their Bibles. Finally, on Friday morning one of the young male campers came to me with the right verse! Their counselor said that they read three full Gospels until they found the answer I was looking for! This same cabin group also won the cabin clean up award! Party time for cabin 12-A. That brings us to Music Camp week. Leadership Camp starts this week too as well as Primary Mini-Camp later this week. I will get another article next week to recap all three of these camps for you. For now, keep on praying as we need your prayers to help beat the heat of the week! The weather is brutal so far and will only get hotter as the week goes on. Chaz and I supplied them with pizza, soda and snacks for a party in the Session Leaders air-conditioned apartment! Each year Memorial Day brings out many of our Latino Churches for a day of food, games, worship and all around fun and fellowship. The day, for me, started at 6 am. as I headed out for coffee and doughnuts for our pre-camp staffers and all of the volunteers that come to help us serve a group this large! Our first two picnic groups arrived at 6:30 am.! I can only imagine what time they had to get up and pack to get here that early!! This year the attendance was down with a total of 944 people in attendance. Last year was the largest crowd that I have experienced at 1,300 people! I am sure that the five days of rain prior to Monday had scared off a few folks. The day was about as perfect a day as one could ask for. Sunny skies, temperatures in the mid-seventies, a slight breeze wafting the wonderful aromas of food all through the camp. I can never think of Memorial Day without thinking of the beauty of the day shared with all of the folks that come to Camp Lebanon to make a day of memories. Of course in my imagination I can almost smell the food! Each year the party at Camp Lebanon seems to start earlier and earlier and continue later and later. Folks from many of our Latino congregations come to Camp Lebanon for the party of the summer! This summer was no different from the past 24 summers that I have been part of. People coming early to claim their spot and set up for an all day fiesta! Once again there were well over 1,000 people in attendance. The weather was beautiful and helped to set the stage for a very good day. One of my chores for this day is to ride around with my good friend Chaz Hutchison and pick up full bags of trash and hand out more fresh trash bags. On one of my trips Chaz called me over to the side of a picnic table to see the two little girls sound asleep in a hamoc. With all of the hustle and bustle going on these two little girls found time to create the most precious picture of the day for me!